Joe Igbokwe, Publicity Secretary of All Progressive Congress (APC), Lagos State Chapter, stated that former Vice President Atiku Abubakar will not be president and that no candidate or party in Nigeria can defeat the APC in the 2019 election. The Publicity Secretary of the party, who is also doubling as Chairman of the Lagos State Wharf Landing Fees Collecting Authority, also stated that Nigeria can never be free of corruption, as political office holders in the country feed on corruption. “Is there any contest? Which party is going to challenge this party in 2019? They are not in power; we know what we are seeing. “Noise cannot help anybody. What will help is the statistics on the table, we will not listen to them because we will fix our eyes on the work. “People must open their eyes to see what is going on; all the rot they left behind in 16 years is being tackled left and right. Let the wailers continue and let them not forget the messes they left this country in 2015,” he said. 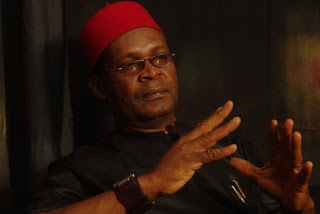 Stating why the party would not support the “Not Too Young To Run” campaign, Mr. Igbokwe questioned the young ones who are aiming for political offices and asserted that experience is required to hold a political post in Nigeria. He also insisted that the youths should wait until they are old enough to hold political posts in the country. “When a young person is coming in, experience matters. The young person who is going to come, we want to know his pedigree - where are you coming from, what are you capable of doing. If you pick a young person and make a governor, when he gets to that seat, he won’t know where to start from because you don’t have the experience and have not done that kind of job before. “The young person cannot teach the old traditions; they should go and learn the trade because you can’t give what you don’t have. I will tell young people to be patient and not sound like a wailer. They don’t understand this country; the young ones are not seeing anything because they don’t want to see it,” he said. Commenting on the cost of corruption in the country, the Lagos APC Publicity Secretary opined that corruption emanated from ex-President Goodluck Jonathan’s administration. He averred that corruption cannot be eradicated from politics in Nigeria. “Some of the things we are facing now were inherited from Jonathan’s administration. Nigeria was looted beyond repairs and the wrath of 16 years cannot be cleared overnight. “What we are going through now is a price we must pay to get out of what we are facing now. I will not speak about Babachir Lawal’s grass-cutting scandal. You will still see pockets of corruption; corruption will not go completely out of this nation because people feed on corruption,” he stated. Mr. Igbokwe also revealed how some people within the administration have been trying to make President Buhari fail. Speaking on the Aso Rock medical center, he said that about N3,000,000 was allotted to the clinic but less than 30 percent was released and that is one of the issues President Buhari is dealing with.